500 g strawberries, washed and hulled. Seeds of one pomegranate (you can use any fruit you wish). Preheat oven to 180 C or 160 C fan forced. The oven we used required heat of 140 C fan forced. Grease and line two 20 cm round cake tins. Beat butter, sugar and vanilla essence until light and pale, then add eggs one at a time, beating well after each until you reach a gooey consistency. Fold in flour by hand. Add from 2 -3 tablespoons of milk until you reach dropping consistency. If the batter doesn't go to dropping consistency (this can happen depending on the temperature of the room you're baking in), don't worry, the cake will still work it will just be a bit more dense (like ours). Bake for 10 - 15 minutes until golden brown. Cool in the cake tin for 10 minutes before turning out on a rack to cool. Repeat all steps, however, only use one round cake tin. You will have three cakes baked at the end, the third being larger than the first two. Bake the third cake for 20 -25 minutes. Combine the green apples and water in a saucepan over medium heat. Cover and cook, while stirring often, for about 8 minutes or until apples are soft. Set aside to cool slightly, then blend to a puree. Add strawberries, icing sugar and vanilla to the apple puree. Cover and cook, while stirring often, for about 10 - 15 minutes or until the strawberries have almost broken down. You can choose to either leave the strawberry pieces within the compote, or puree it all together, we left the strawberry pieces as is. Transfer to a bowl, add lemon juice and stir, then cover with plastic wrap and store in the fridge until needed. Place butter into the bowl of a standing mixer with a paddle attachment and pale. Add half of the icing sugar gradually, then add the milk. Add the rest of the icing sugar. Pale mixture for 10 - 15 minutes, this creates a smooth, light and fluffy buttercream. During this time, add one teaspoon of vanilla essence. Make sure all three cakes have cooled. With the first two, smaller cakes, make sure they are the same size and flatten both tops with a serrated knife. Be sure to trim any overly brown bits. With the third cake, make sure it is the same size as the first two cakes (in roundness), but do not cut off the top as this will be your top layer of the cake and you want to leave it domed. Place one of the first cakes down onto a cake board, if you have a rotating cake stand - use it. 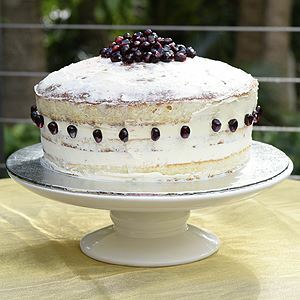 Using a spatula, place about 2-3 tablespoons of compote in the middle of the cake and smooth it out, ensuring you've left about 2 cm worth of gap from the edge of the cake. Using a piping bag, pipe two rings of buttercream around the edges not touched by the compote. Place the second cake on top and repeat the compote and buttercream step. Place the third domed cake on top of the other two layers. If your domed cake has collapsed slightly in the top, fill this with compote. Place about 2-3 tablespoons of buttercream on the top of the cake and roughly frost the top of the cake with a spatula. Using a piping bag, go around the cake and add more buttercream to the layers. Using an edging tool, or spatula, lightly spread the buttercream around the edges of the cake. Do not frost completely or it won't be "naked." Add the pomegranate seeds to the top of the cake and embellish one of the layers with pomegranate seeds, spaced about 1 cm apart. Congratulations! You've made a "naked cake." Enjoy. This cake doesn't need cream, but you can certainly add it to a slice when serving. An AGFG How-To of this recipe is on our facebook page and youtube channel. See below!